I hope you all had a wonderful weekend! It totally hit me that we have one week left of summer vacation and then my kiddos are off to school. 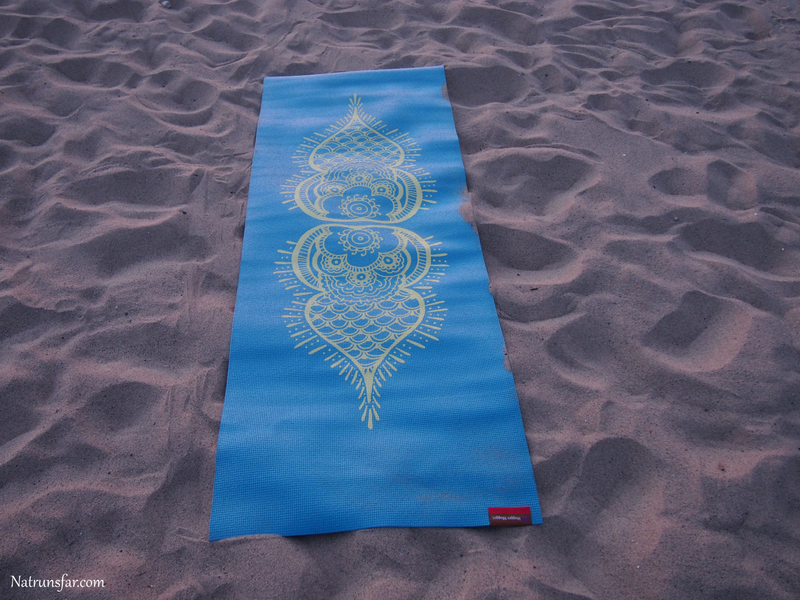 I really can't believe how quickly the summer flew by. My two girls are going to Kindergarten and preschool and my son is off to third grade! I had a huge moment of sadness today that my babies are really growing up. It's surreal. Also, I wanted to share that my running is progressing nicely and it is one of the highlights of my day. On Sunday I decided to get back into the pool for aqua jogging! Alternating between the bike and running in the pool + running everyday, the goal is to build back my cardiovascular fitness gently and safely. 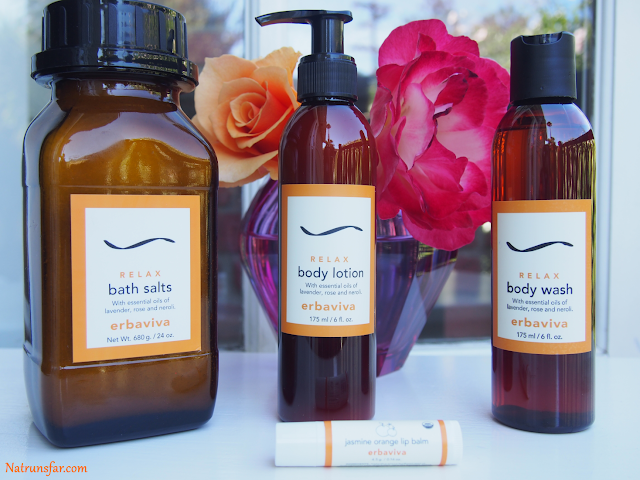 Everything was perfectly matched to use together as a complete bath (or shower) ensemble. I decided a wonderful soak in the bathtub was right up my alley! 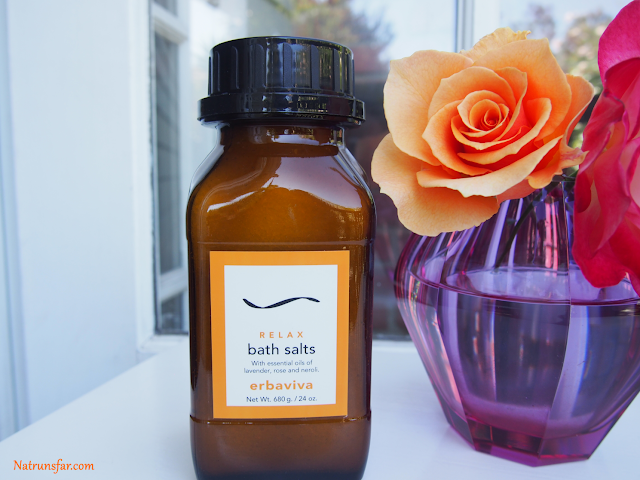 First I ran a nice warm bath and then I added the Relax bath salts from Erbaviva. When I opened the bottle, the smell was incredible. The bath salts contain the essential oils of lavendar, rose and neroli. Neroli is an essential oil produced from the blossom of the bitter orange tree (source). 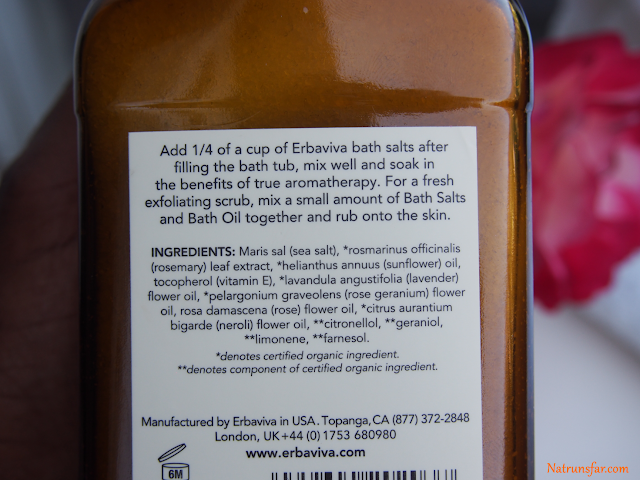 The oils combined together made a lovely scent and I couldn't wait to dive into the bath! The texture of the salts were tiny, fine grains that dissolved easily into the water. Another use for the salts, is that they are gentle enough to use as a body scrub! 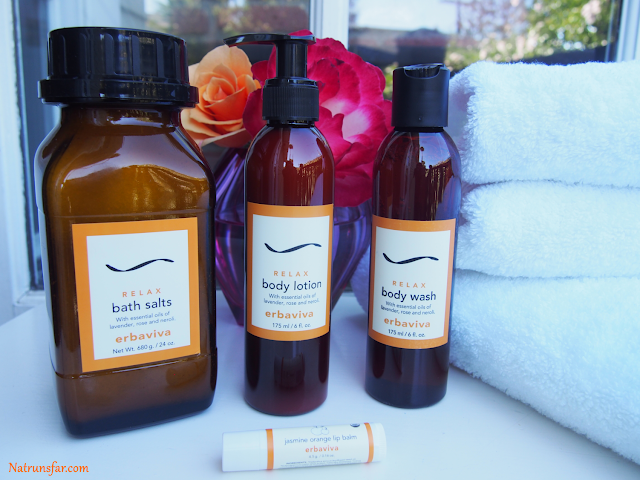 You simply combine the salts with the Relax body oil from the same company. I love that there were multiple uses for the salts and my bath was absolute heaven. Next, I was ready to use the body wash and lotion and it did not disappoint! The Relax body wash lathered up so easily, which meant I didn't have to use a lot. The wonderful smell immediately relaxed me and I could have stayed in the bath all day! 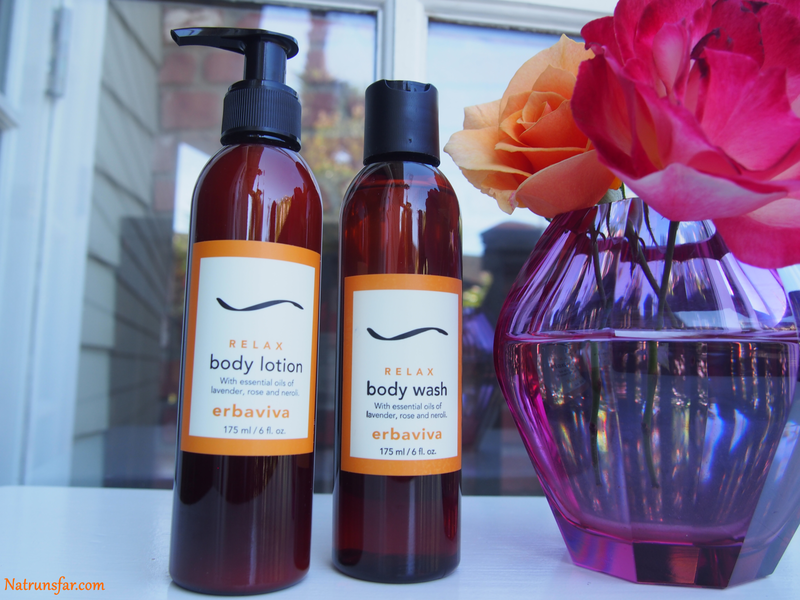 Afterwards, I used the Relax body lotion which was also a treat. The lotion went on very easily and was extremely moisturizing. Bonus = my entire bathroom smelled like a slice of heaven! The last item I tried was the jasmine orange lip balm. 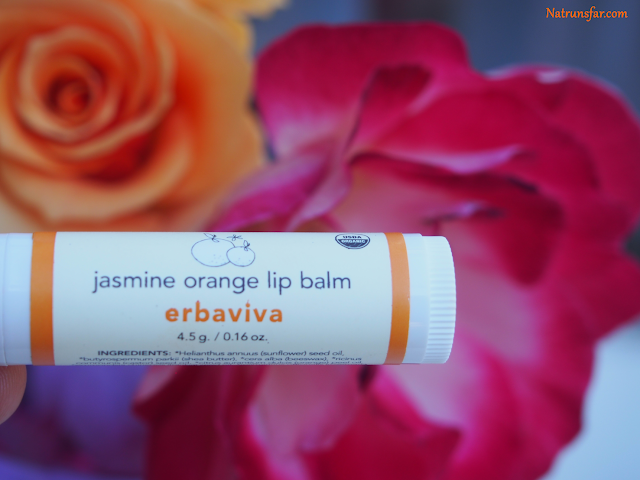 I really love this lip balm and I have been using it every day! I even included it in my Friday Favorites this week! The balm makes your lips super soft and moisturized (perfect for runners), PLUS the smell is awesome!! Okay, I am really jazzed to share with you the last item Vivaiodays sent me. Or I should say, BROUGHT me. They were so sweet to personally deliver everything to my house since I live in Santa Monica! When you shop at Vivaiodays, they will assign you to a child in Africa to help support that child's education! For every $10 you spend on their site, $1 pays for a day of school education, meal and healthcare for your Vivaio Child. So ---> go check out their site and happy shopping!! Disclaimer: I was given these five items for a review. All opinions are my own. Parents ----> Have your kids started school yet?